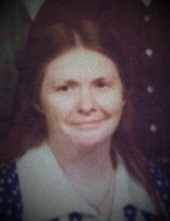 Nina Pauline Stewart, 76, of Catlettsburg, passed away Friday January 11< 2019 at Community Hospice Care Center. Mrs. Stewart was born April 27, 1942 in Greenup County, KY to the late Fred and Minnie Salyers Akers. Nina was a cook for the Bluegrass Grill and a dedicated homemaker. Her hobbies were embroidery, crochet, playing cards, bingo, and especially playing with her grandbaby Shaylynn. Nina is survived by her daughter Marlania Wright, her husband Stephen, of Catlettsburg, one precious granddaughter, Shaylynn Wright. She was preceded in death by parents, husband of 29 years Harold Lee Stewart, brothers, Thomas Akers, George Akers, Fred Edward Akers, Kr, Bobby Akers, Eldid Akers, and sister Geneva Akers. A Memorial Service for Mrs. Stewart will be at 11:00am Thursday, January 24, 2019 at Catlettsburg First Church of the Nazarene, 1400 Center Street, Catlettsburg. Pastor Frank Hulett will officiate. To send flowers or a remembrance gift to the family of Nina Pauline Stewart, please visit our Tribute Store. "Email Address" would like to share the life celebration of Nina Pauline Stewart. Click on the "link" to go to share a favorite memory or leave a condolence message for the family.